Leading up to the Oscars, it was only fitting to watch a Best Picture winner. 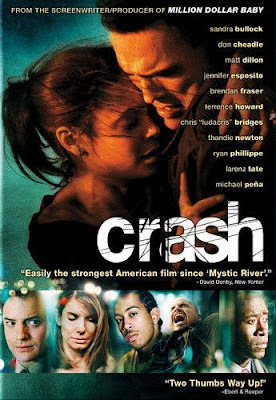 That winner was Crash (2004), the surprise winner which beat Brokeback Mountain, the one which was supposedly going to win. Anyway, I see why this movie won. Crash is basically an examination of L.A., set in around 24 hours. We follow many characters, including a couple who are car-jacked, another couple who were pulled up by the police, but ultimately a murder. One of the biggest features in this film is racism. While I can't really explain the plot of this story, it was still immensely interesting. The cast is great, just as any multi-plot film would be. It stars Sandra Bullock, Brendan Fraser, Jennifer Esposito, Thandie Newton, Don Cheadle, Terrence Howard, Matt Dillon, Ryan Phillipe, William Fichtner, Ludacris, plus many more. Paul Haggis has created an un-seen world, which is visited with harsh truths, thanks to it's hard look at racism. As it zips back and forth between each set of characters, you see different perspectives on life, death and work. It's hard to pick a particular stand-out in this film, because each member of the ensemble cast is equally as great as the next. However, I think Thandie Newton did well in her character. Crash was so great, it was just oozing with Oscar glory. The first B747 crash was about 5 years after entry into service. The first A380 crash should take much longer? Movie Crash:different characters and the ways they were portrayed that is consistent with different attributes? What caused the Emmerdale plane crash, i don't remember a reason for the plane crashing being determined?